Money can be a big source of stress. Maybe you and your partner disagree about the budget. Perhaps you're struggling to reduce debt, dealing with a loss of income, or recovering from a financial crisis. Or perhaps you're trying to determine how to be smart with your savings, become a better investor, and create a better financial future. In any of these situations, you need the ability to calmly and rationally assess your options and make decisions for your future. Stress has a huge, negative impact on your ability to make good decisions. In fact, stress prompts us to act quickly and instinctively, and reroutes the energy needed by the brain for wise decision-making, according to Stanford health psychologist Kelly McGonigal, PhD. "Stress also encourages you to focus on immediate, short-term goals and outcomes," says McGonigal, "but self-control requires keeping the big picture in mind." An excellent way to combat stress is to give to others. 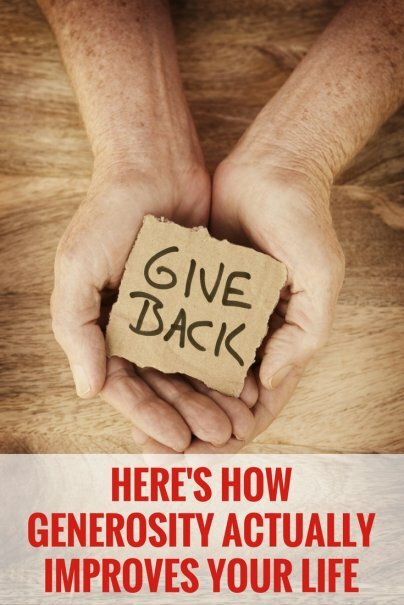 Whether it's your time, your money, or your unwanted items, giving to those less fortunate will give you a sense of purpose, it will make you feel better about yourself and the world you live in, and can reduce your anxiety. That combination equips you to better handle stress when it does occur, keeping it in perspective. And you'll be able to more calmly and rationally make financial decisions for yourself and your future. Hard times happen, but consistent generosity — whether through volunteering, acts of kindness, or monetary giving — can lead to an extended network and stronger relationships. Meeting people at volunteering events can create lasting friendships. Helping out a neighbor when they need it most will solidify a true bond. And when you need those people to be there for you in return, they most likely will be. I've experienced the financial perks of having a strong support network many times in my life. For example, during my mother's fight against breast cancer, my friends and family brought food, baby-sat (both my sister and I had young children), ran errands, made phone calls, organized important information, and, when needed, assisted in bedside care for my mom. If I didn't have a loving support system willing to do those things, I would've had to, either do it all myself — which would've increased my stress to an unbearable degree, or I would've had to pay someone to help out — which would've sucked my bank account dry. A community of friends bringing you meals when you're unable to shop and cook saves you the cost of takeout. When your network pitches in to watch your kids, help you with a big project, or loan you a needed resource, you save the money you'd have otherwise spent to get those things done. It's all about who you know, right?